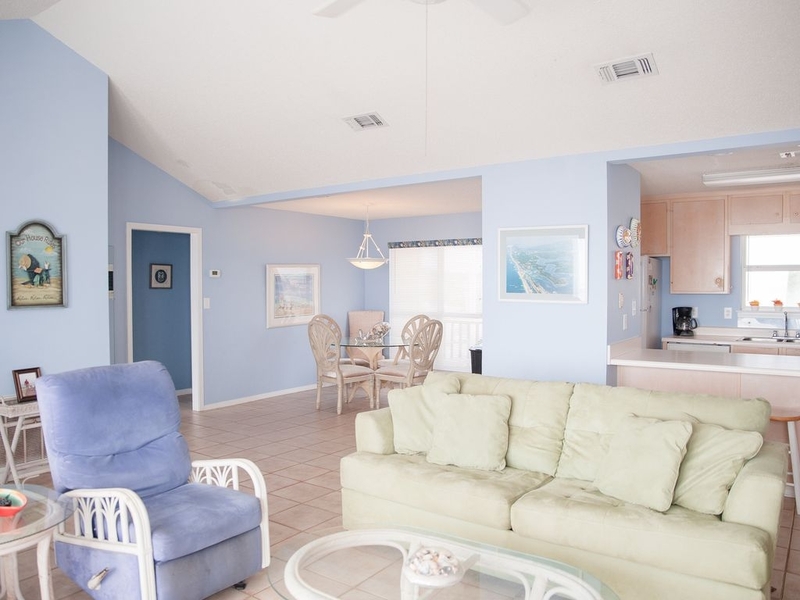 Enjoy the beautiful, unobstructed view from the large beachfront deck, or walk directly to beach and the fabulous Gulf waters. Watch for the dolphins when the Gulf is calm, and enjoy riding the waves with your boogie board when the surf is up! 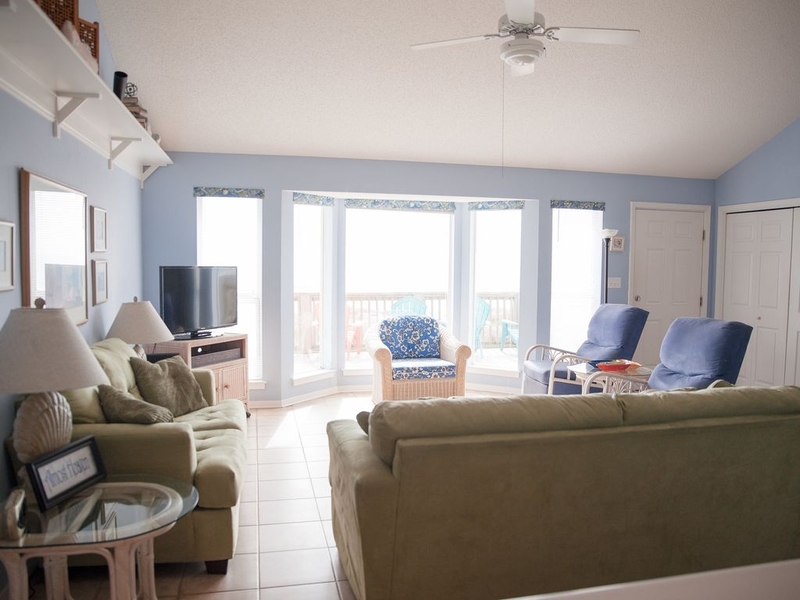 Almost Heaven is a freshly decorated beachfront home with tile floors throughout and ceiling fans in all rooms. The furnishings are tasteful and comfortable. 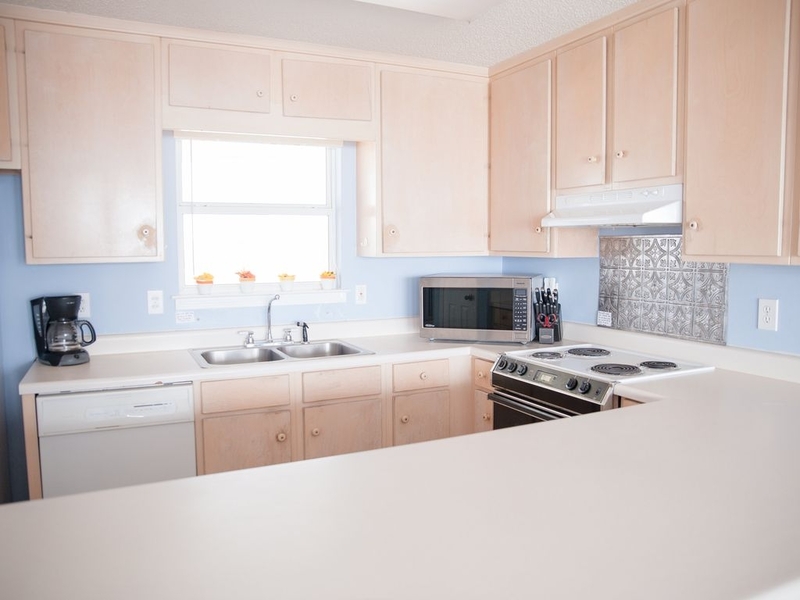 The kitchen is fully equipped, including a full sized refrigerator, range, dishwasher, microwave, and small appliances including a crock pot, hot plate, hand mixer, blender, coffee maker, and more. 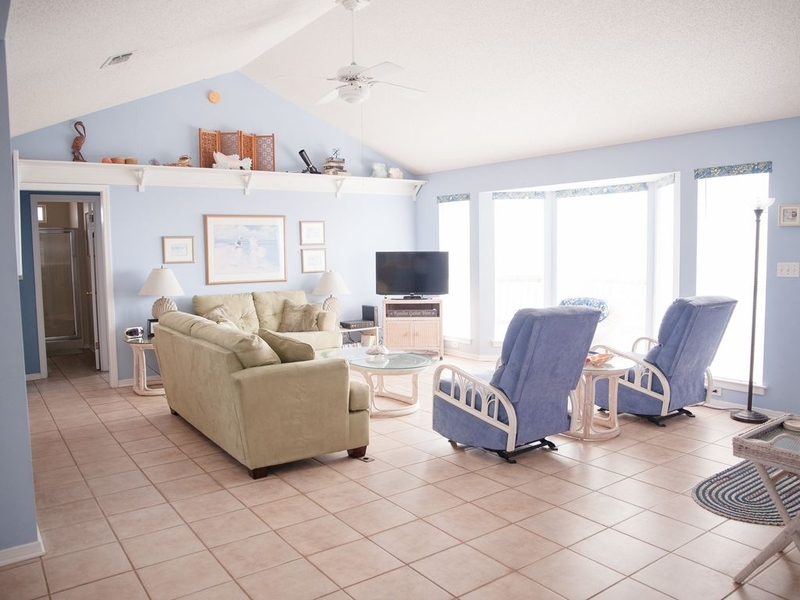 The living room has cathedral ceilings and a wonderful view of the beach and gulf from the sofa, chairs and two matching recliners. 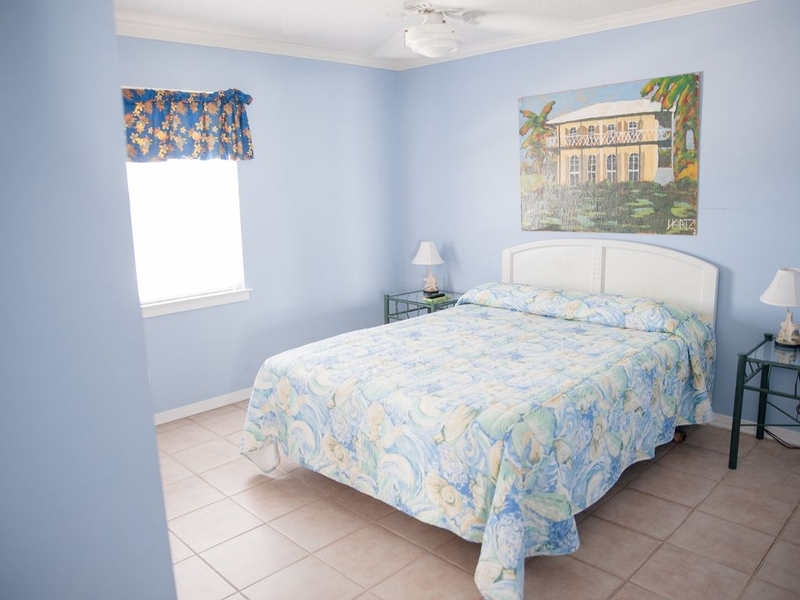 It also has satellite TV and additional televisions in three of the four bedrooms. The fourth bedroom (two twin beds) has an old school tv/vcr, and we have many movies. This is ideal for younger children. 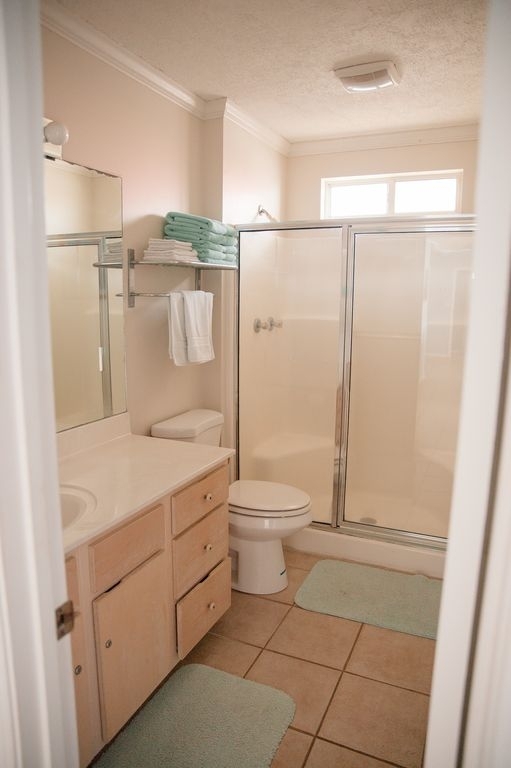 All four bedrooms have large built-in chests of drawers and spacious closets. 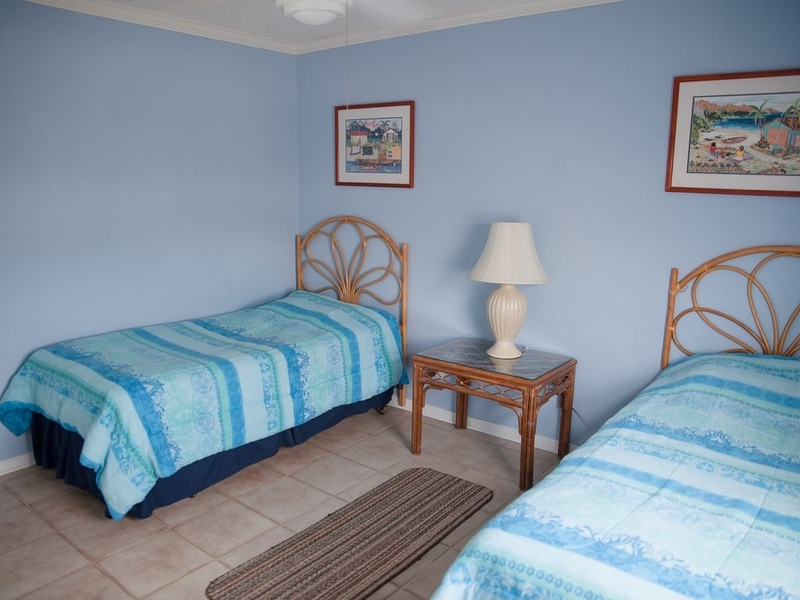 Two bedrooms have King beds, one bedroom has a Queen bed, and the fourth has two twin-sized beds. We also have a Fisher-Price 3-n-1 travel portable crib and highchair. A queen sized sleeper sofa is available in the living area. 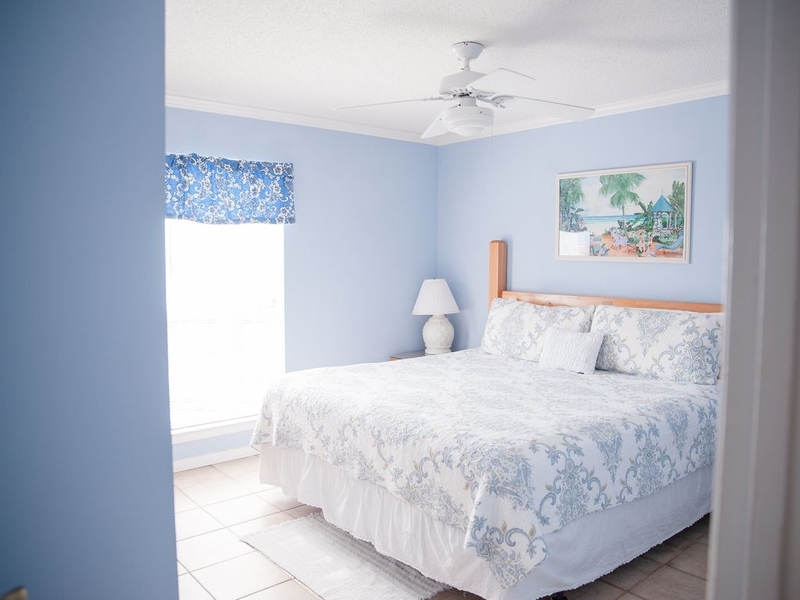 Linens and normal cleaning are included in the rental fee. Parking is located under the home. Amenities: We are members of The Beach Club, and as our guests you can enjoy all of the privileges that The Beach Club has to offer (administrative fee from The Beach Club applies/$35 per day of use covers the group).You can enjoy swimming in any of the Five outdoor pools, and sunbathing areas at The Club. There are also Five Jacuzzis, two steam rooms, two saunas, indoor pool, exercise room, an European health spa with fees, game room, and gated playground. The Beach Club offers fine dining at the Beach Club Restaurant which includes a lovely outdoor balcony overlooking the pool and Gulf of Mexico. More casual dining is offered at the Village Market where you can also purchase groceries and gourmet sundries. If you prefer to snack by the pool, there is a tiki bar offering frozen summer drinks and an outdoor grill. In addition, there is a soda fountain and delicious ice cream parlor at the Village Mercantile. There are activities offered for all age groups. 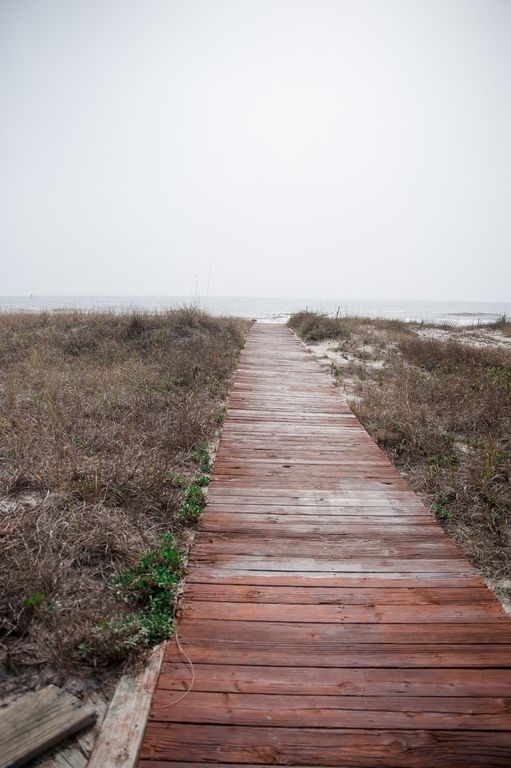 The area is abundant with fabulous golf courses: Kiva Dunes, The Peninsula, and Craft Farms, just to name a few. There are also tennis courts at the Beach Club. During the summer months, there are planned activities for the young ones, such as visits to the zoo, face painting, pizza parties, and contests of all kinds on the beach! In addition, there are planned winter activities for the snow birds! 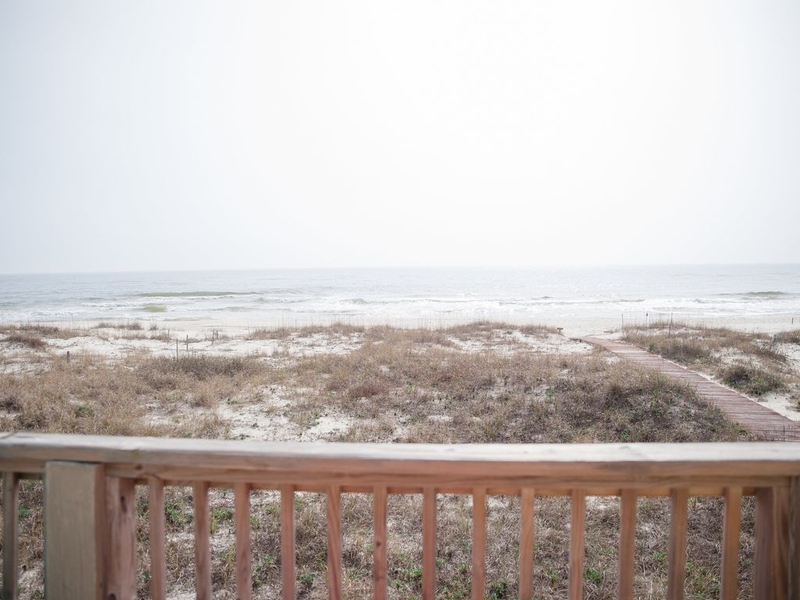 While the house is lovely and very comfortable, the most impressive feature of Almost Heaven on the Beach is the front yard: white sand and the Gulf of Mexico. The house itself is so relaxing. The view is incredible. Almost Heaven is designed to bring families together. It is close enough to 'town' to enjoy going out to dinner or souvineer shopping, but in a private neighborhood where you will enjoy your space and privacy. Enjoy getting to know each other again. That is what family vacations are for. Activities: The Club & Spa at The Beach Club Guest privileges at The Club & Spa which include: - Indoor heated and outdoor heated pools - Fitness Center - Children's Playground (gated & extensive) - Steam rooms - Saunas - Tennis courts (lighted) - Basketball court - Spa - Restaurants (2) and much more. 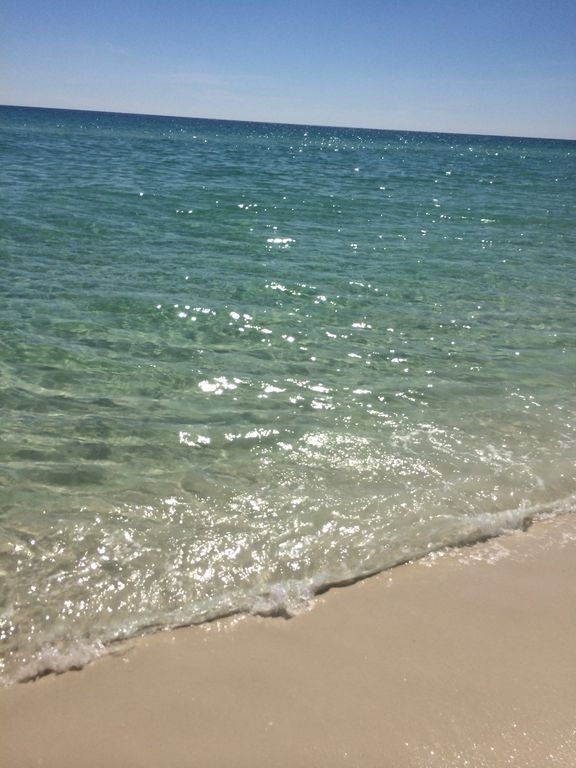 Guests are required to pay an administrative fee per day of use for a guest's pass ($35 per group per day of use/optional).The Club & Spa can be visited by a short walk (10 minutes) along the beach or driving. 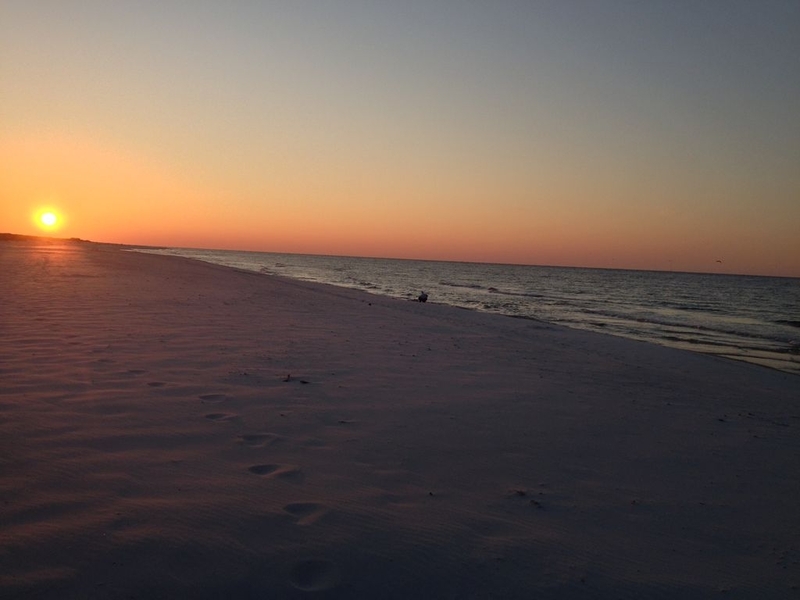 Golf: Alabama's Gulf coast is a golfter's paradise! Cotton Creek: 18 holes. Course length: Championship 7,028 yards; blue 6,581 yards; white 6,032 yards; red 5,175 yards. Cypress Bend: 18 holes. Course length: Championship 6,848 yards; blue 6,424 yards; white 5,954 yards; red 5045 yards. Kiva Dunes: Course Length: Gold Tees: 7,092 yards; blue 6,464 yards; white 5,849 yards; red 5,006 yards. Peninsula Golf: 27-hole championship course. Public welcome. Golf Digest four-star rated. Course Length: Gold 7,026 yards; blue 6,494 yards; white 5,799 yards; red 5,072 yards. Ski: No snow skiing is offered at our gulf paradise, and you will never have to scrape ice from your windshield. If you would like to waterski, parasail, or go deep sea fishing. 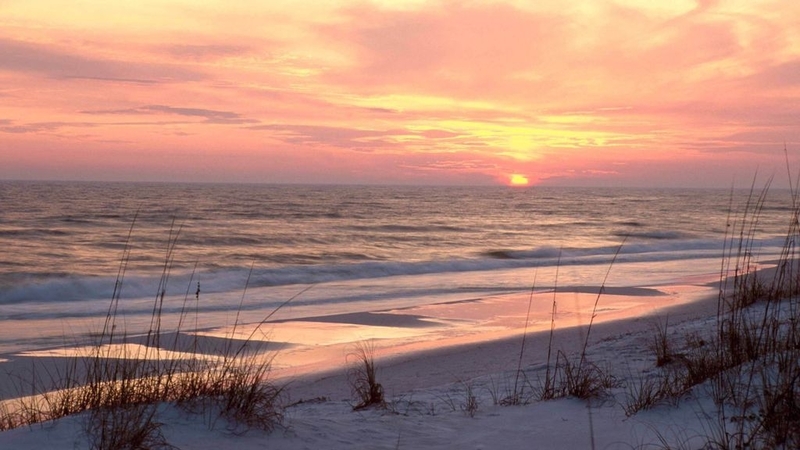 Almost Heaven is a treasure, directly on the beautiful Gulf of Mexico. The view will take your breath away, and the gentle crash of the waves and salty tang of the air will lull you into the best night's sleep you have had in a while. The great room, with its comfortable seating, grand view, and cathedral ceiling, is a great gathering place. 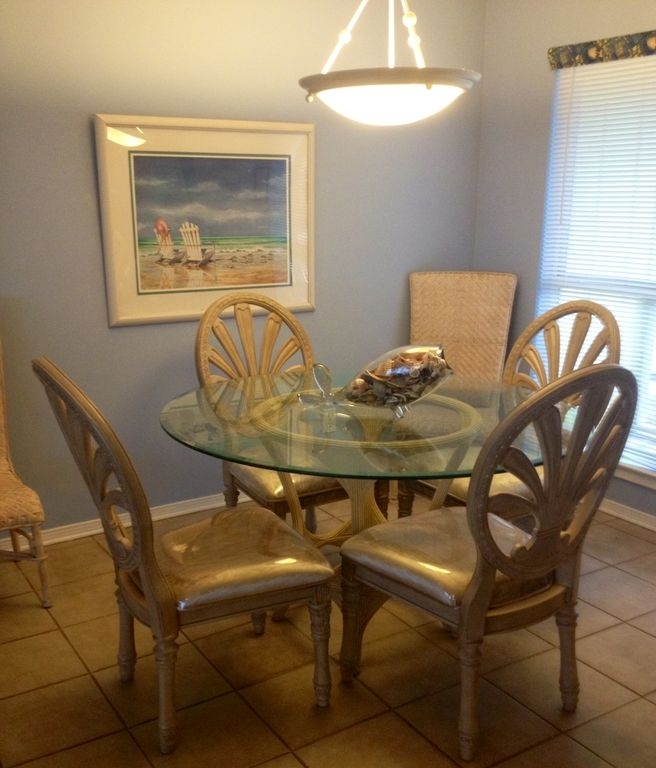 The round dining table was chosen because it is ideal for board games and card games. 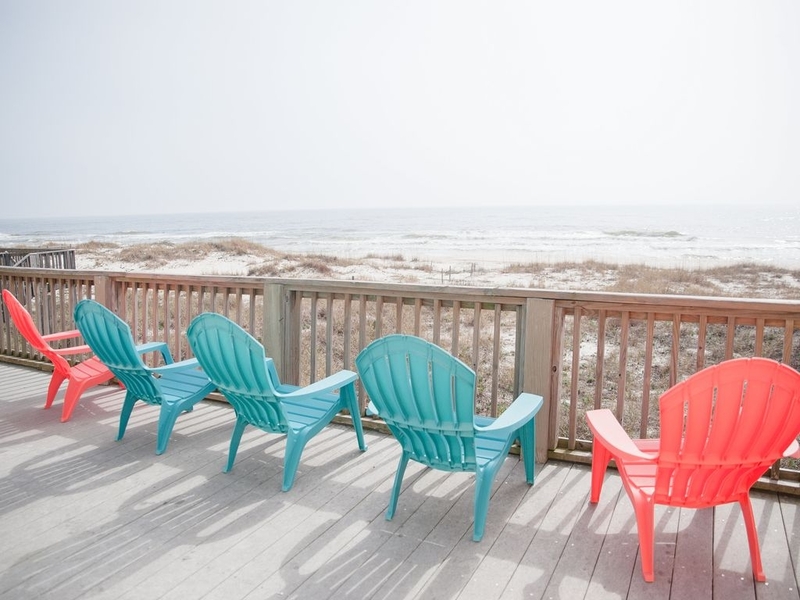 Whether you are planning a reunion or honeymoon, our Wedding quiet, out of the way cottage on the beach is a place for making memories, reconnecting with those you love, and unwinding. We hope you love it is much as we do. We hope that you'll say as so many others have, "The only thing wrong is the name. It's not Almost Heaven, It IS Heaven! "The four bedrooms are outfitted with ceiling fans, large closets, televisions, built in chests of drawers, and comfortable beds. 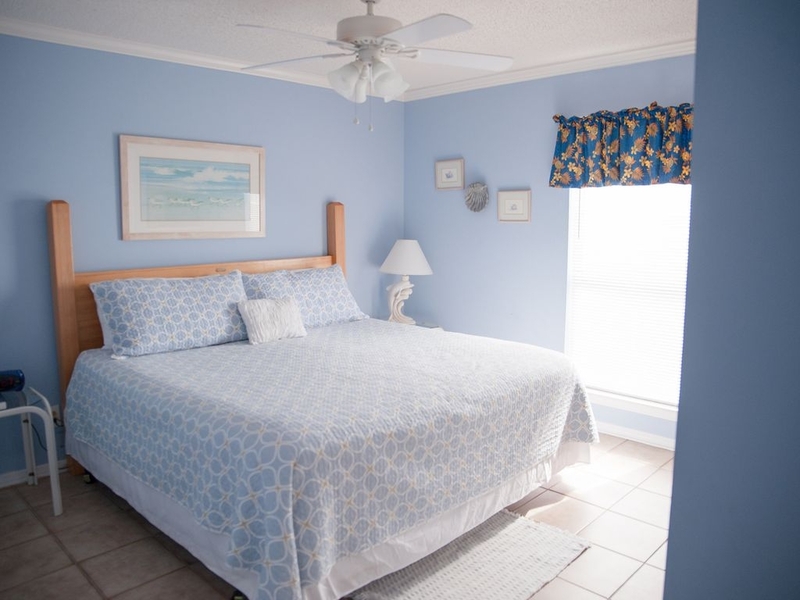 The two southern bedrooms have perfect views of the Gulf of Mexico! Puzzles, books, and board games are located on the top shelves of two bedroom closets. No pets. No smoking. No high school or college groups. While we provide cancellation refunds up to 30 days before your arrival, we suggest you look at a travel insurance policy, such as Allianz. We always get a travel policy when we plan a vacation. Also, if the National Weather Association calls for a mandatory evacuation, you receive a refund. 5% discount always for US Military active, reserve, retired with ID. John and I met on a church hayride when we were just kids. 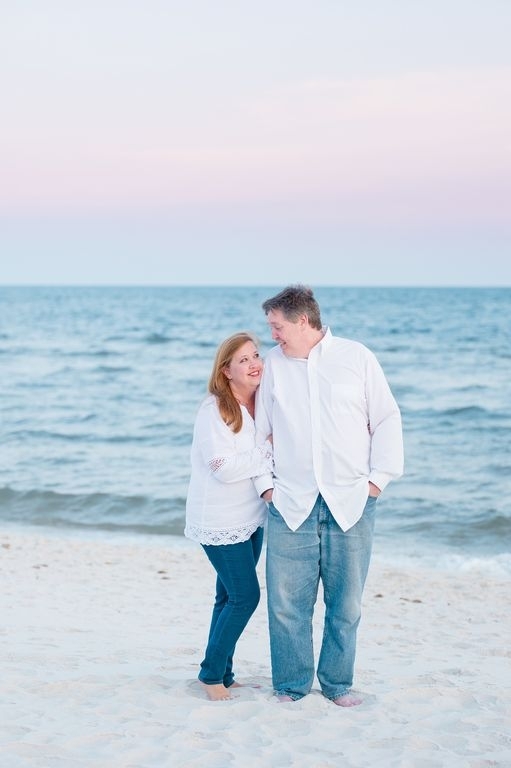 Married in 1986, we have lived in central Alabama, Ohio, San Francisco, New Zealand, and Poland. 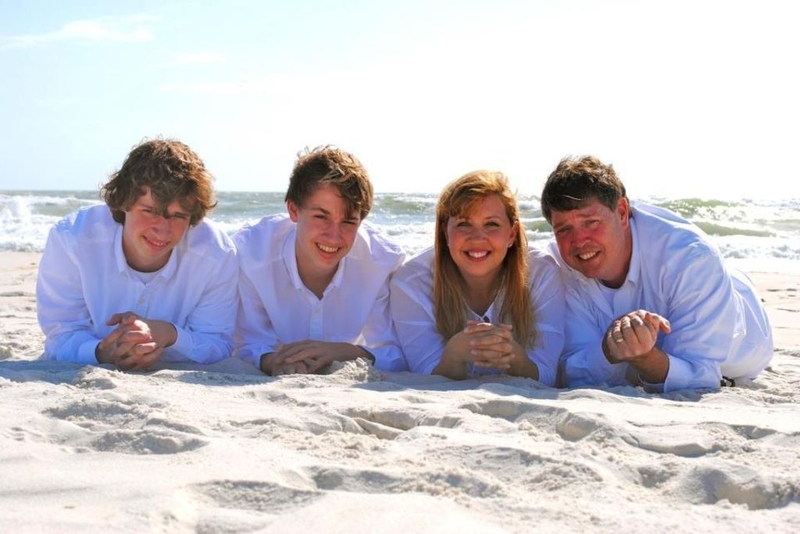 When John began to work from home, we planted roots on Alabama's gorgeous sugar white sand. This blessing known as Almost Heaven has been a joy to offer to families, and we have always had perfect guests! It is true! We have the best guests in the world, and many come year after year, check on us during storms, and they are like family to us now. We raised our children on these beaches, and now they are grown. Thankfully, this precious little strip of paradise keeps bringing them back to visit us too! 2006 at Almost Heaven on the Beach in Fort Morgan. We would not have changed a thing if we could have. The water was beautiful, the sand white, the dolphins were out every day, the home was perfect and the pool fabulous. If not for a promise to a 5 year old to take a Disney Vacation in 2007 we would definitely be back again this year. We get sad everytime we think about missing our vacation on the beach this year. 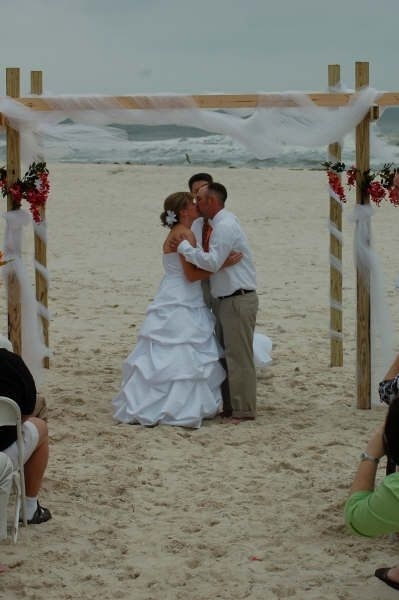 But you can bet we will book early for 2008.
and we hope to continue them for years to come at Almost Heaven on the Beach in Fort Morgan, AL. What a special place to share with your children and grandchildren! Awsome! Great vacation rental. 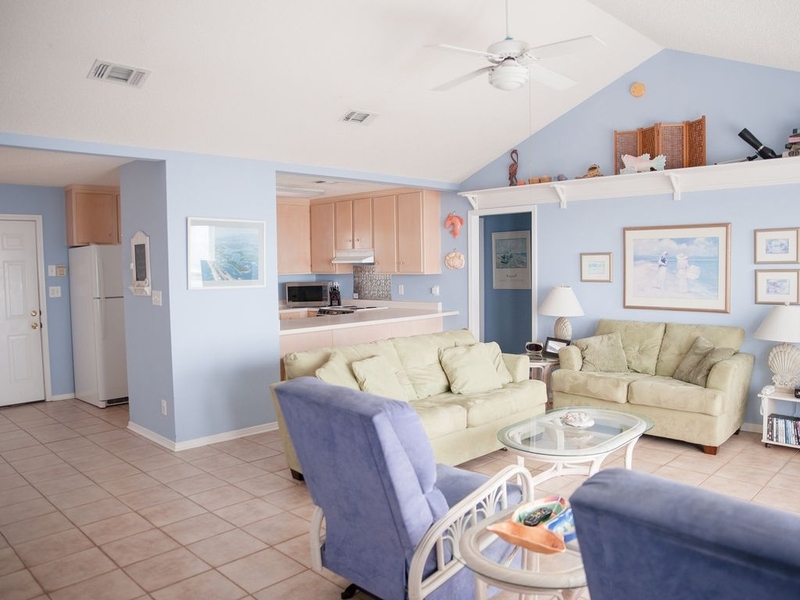 I recommend it to anyone who wants a guarantee of the perfect vacation rental. 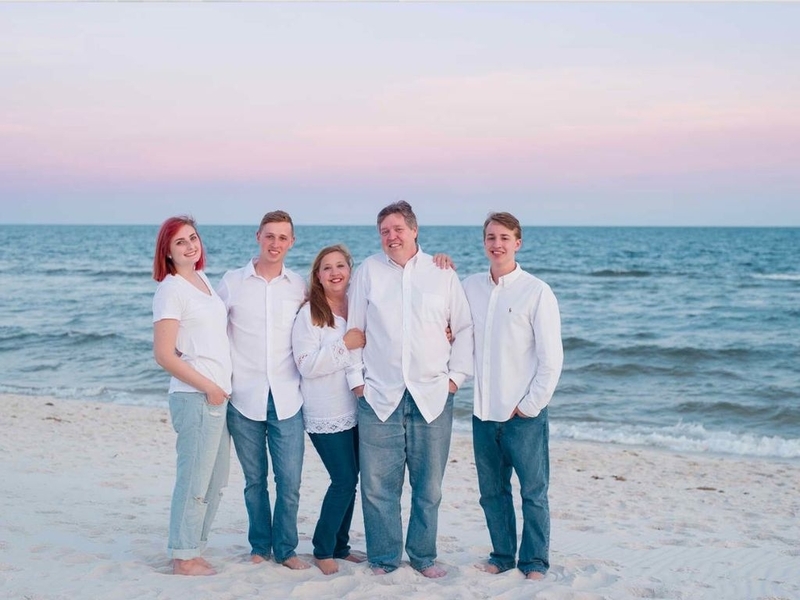 My family and I have been on many beach vacations, in Florida, Hawaii, South Carolina, Rhode Island, Massachusetts, Maine, etc…, but none have compared to the week we spent at Almost Heaven on the Beach on the Gulf of Mexico. 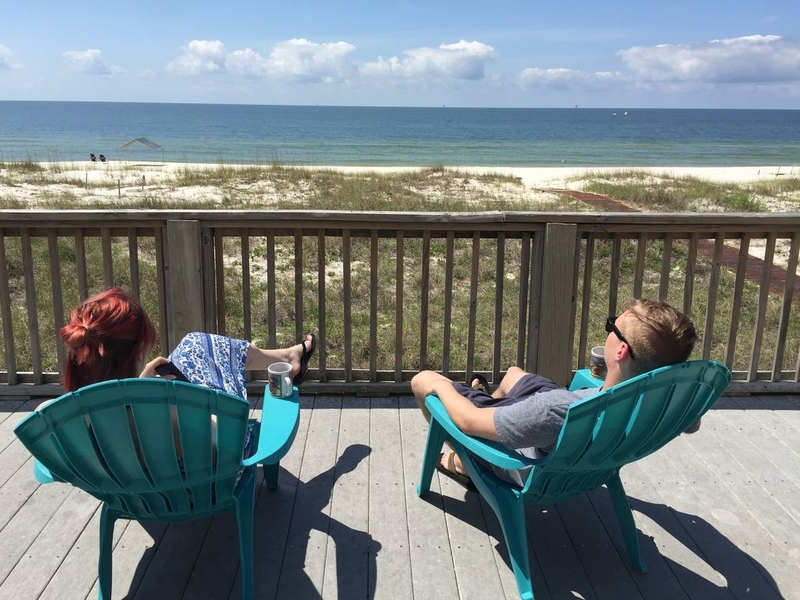 This was our first and definitely not last visit to the Gulf Coast and we would definitely try to stay at this wonderful beach house again. It was everything and more than its description. The views from inside the house and, of course, the amazingly large deck, were spectacular, especially at sunset. The beach was clean and beautiful, the sand was like sugar. The house had everything we needed and more. The furnishings were comfortable and clean. The kitchen had everything you could possibly need. There were tons of beach toys and boogie boards. There were movies to enjoy when we’d had enough sun for awhile. There were games to play and books to read. And then there was also the Beach Club, which was an extra added bonus. It was only a short walk down the beach and we could enjoy a swim in the beautiful pools or a soak in one of the many hot tubs. And my kids especially loved the game room. 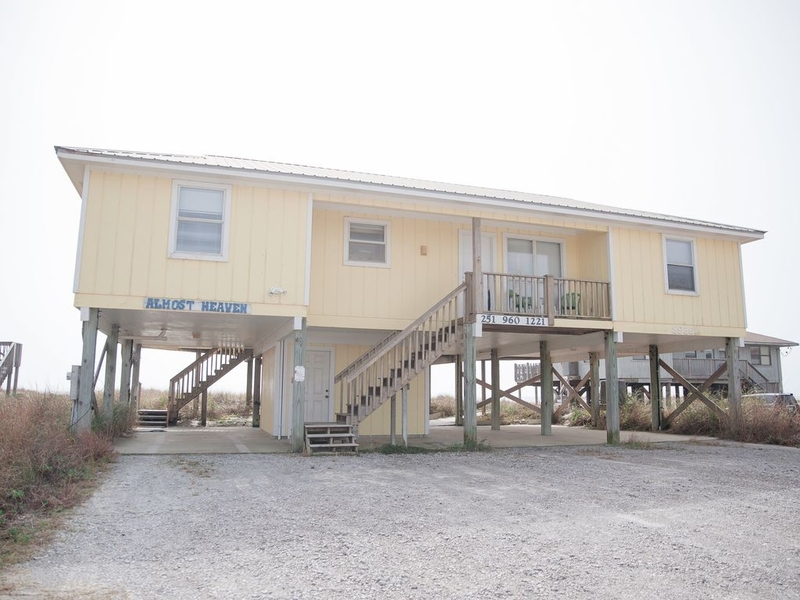 There is no question that we would stay at Almost Heaven on the Beach again and we would highly recommend this house to everyone. Almost Heaven? Our Week Was Pure Heaven! I have found Utopia, and its name is Almost Heaven on the Beach. The location is perfect, private but convenient to everything we needed. 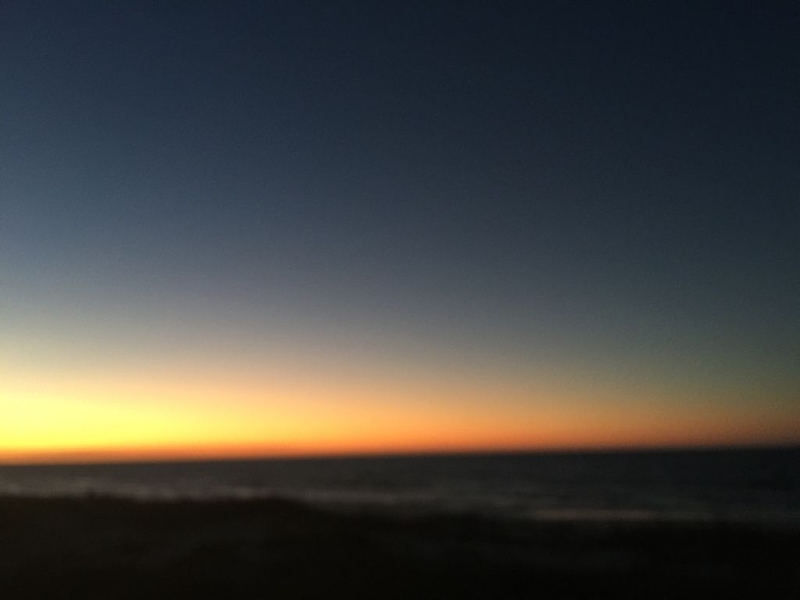 The house is beautiful, and my eyes were constantly drawn to the southern bank of windows and the Gulf of Mexico right at my feet. My dad and my husband took over the rocker/recliners, while mom and I enjoyed long beach walks with the kids. We hunted sandcrabs at night, cooked fish and shrimp in the well appointed kitchen, and had the best night's sleep ever after long days in the sun. I started my day on the spacious front deck, lounging with a book, my coffee, and surprising dolphin shows! They did not just swim by, they would play for thirty minutes at a time right in the front "yard." When the guys wanted to watch sports, they were pleased with the flat screen in the den, and everyone had tvs in their bedrooms for those who wished to forego sports:). We ate out a few nights (DeSoto's is GREAT), and played cards, dominoes, and board games almost every night, all supplied in the house. We never used the movie library, and we brought our own books, but both of those were available as well. 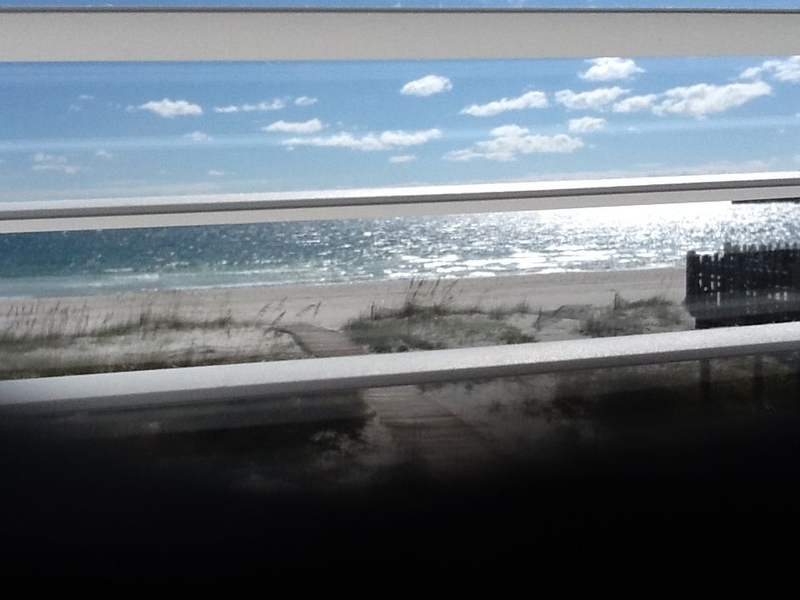 I have never been one to covet, but I have to say that leaving our beach house was tough. To say I am looking forward to our next visit is an understatement. I am counting the days until our next vacation at Almost Heaven on the Beach. Almost Heaven is the Perfect Description! "Almost Heaven" is the perfect description! 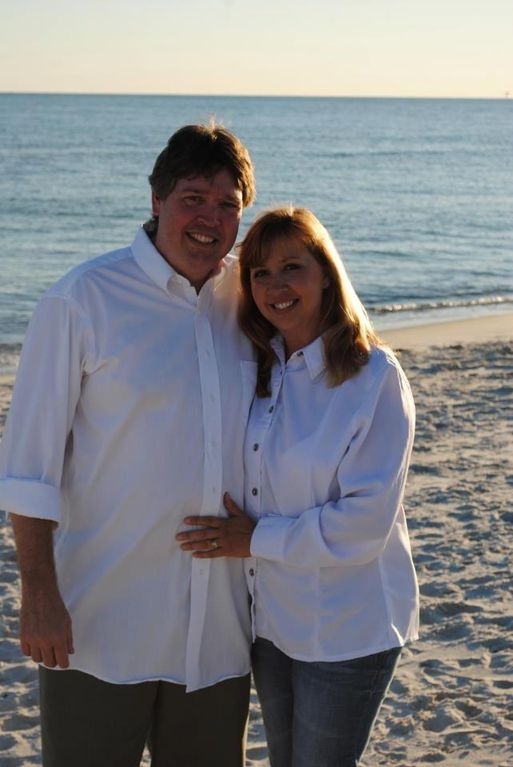 After years of staying in large condos in Gulf Shores, we decided for a change of pace and contacted the owners of Almost Heaven. I was so glad that we did! Our crew consisted of 2 seniors, 2 adults, 2 teens, and 1 toddler. It was perfect for each and every one of us. The house was beautiful inside and out. There were games and puzzles in every closet. There were supplies that we may have forgotten to pack. There was a washer and dryer that we made good use of. There were beach floats and toys of all shapes and sizes. There were videos and dvds as well as satellite and saved movies on tv. There was a grill and patio furniture...just to name a few things. There was no hustle-bustle of a busy tourist area. It was like our own private get-away! Within walking distance, there was the beach club that not only had swimming and tennis areas, but activities planned for all ages every day. I never had to worry about my teens and there was plenty for my parents, my husband and me, and my youngest to do. We had so much fun grilling out every night that we never wanted to leave and go to a restaurant even though there were plenty of them nearby! Finally, the owner of Almost Heaven treated us like a good friend, even though we had never met and I will never forget her. My entire family agrees that we will only stay at Almost Heaven when we plan another vacation to the beach! Want to Drop the Rush of Life? We Did! Want to just drop of the rush of life? We did! What a wonderful get away. Clear water, weather perfect and the house was just perfect for our family. Our grown sons and family's came, lay out was great. Beds SO comfy, kitchen well supplied. Views from the house are super. We enjoyed everything from having our morning coffee on the deck to home made ice cream in the evening. So easy just to wander down the beach to eat, swim, spa since we house visitors have access to it. The pictures here do not do this home justice. We felt like we were home. We are planning to come again and again. So much nicer than a condo with people and rules on top of you. We stay every year in November and we love it! It is the perfect place for our family and little boy! He loves playing out on the deck and I love relaxing there. I always come back from that week relaxed. Its clean, organized, and feels like home! The owners are awesome to work with and the view is worth a million bucks!!! 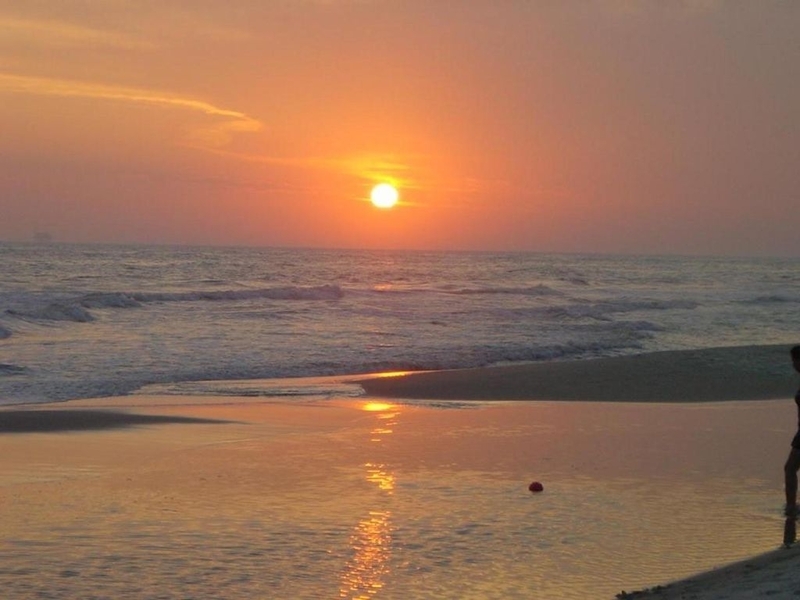 Beautiful beaches and nice quiet atmosphere! Internet works great and a huge movie selection! 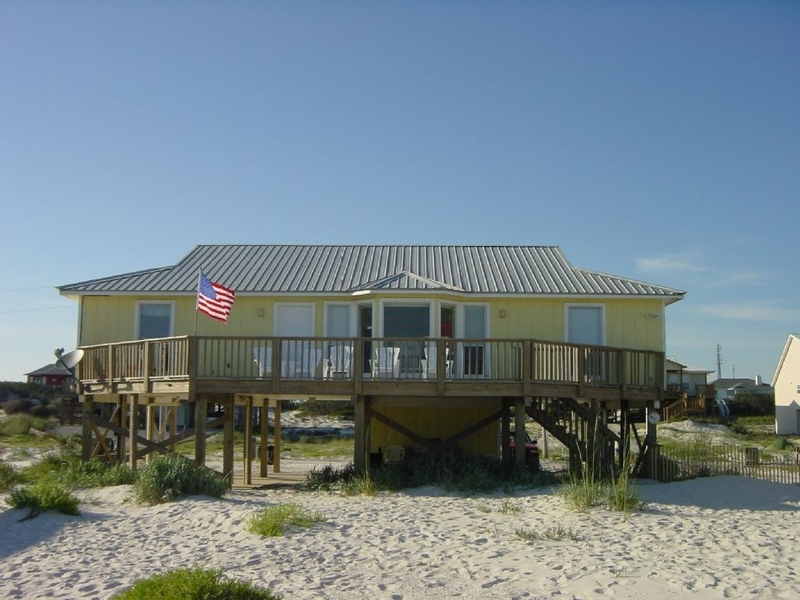 This is the most wonderful beach home on the Alabama Gulf Coast. They had to send the sherriff out to make us leave. I offered them one of my kids to let us stay another day. This home was a wonderful experience. Very true to the description and very informative to activities that are available in the area. We highly recommend this home and we thank you for opening your home and sharing your wonderful view and gorgeous sunsets.